Hey, that's a real gaster! Nice fly, guessing that's a bead surrounded by thread? I tie something similar. Build up of two thread bumps covered in 5 minute epoxy. Good to hang off the back of a cricket or hopper. But I'm not quite sure how you got the red AND translucense at that back. So, I've tied the Transparant - aka hardbodied ant. 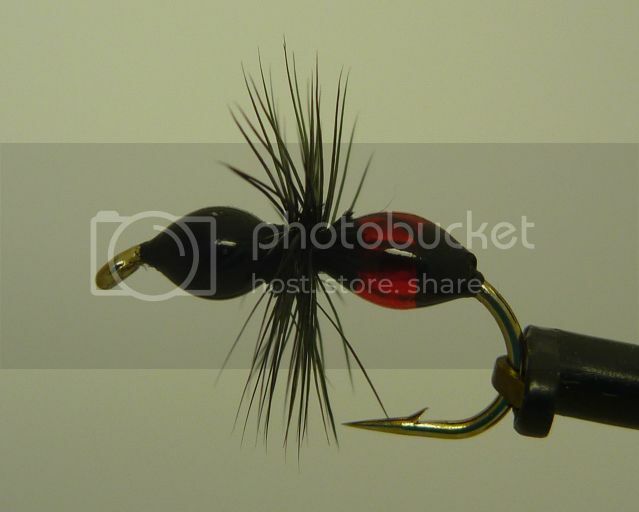 FWIW, I don't actually tie in a hackle. Rather I tie in legs use tying thread, Krystal Flash, whatever. Also, try tying them in yellow for bluegill. Good idea Steven. I'll try some with black crystal flash. I wonder how they would be using Clear Cure Goo instead of epoxy? I three second kick time sure seems like it would beat the pants off of two part 5 minute epoxy.